Rep. Dan Moul (R-Adams/Franklin) joined Gov. Tom Corbett and Lt. Gov. 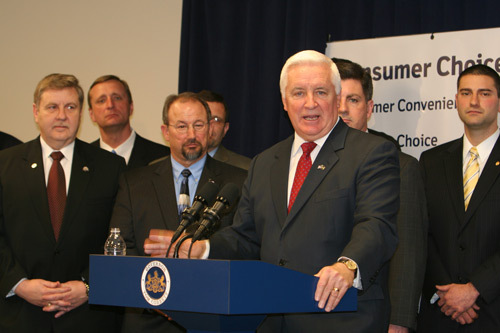 Jim Cawley in Pittsburgh for the announcement of the administration’s plan to privatize liquor sales in Pennsylvania. HARRISBURG – Rep. Dan Moul (R-Adams/Franklin) traveled to Pittsburgh this week for the announcement of the Corbett administration’s plan to privatize liquor sales in the Commonwealth. The administration proposes to dismantle the wholesale and retail operations of the Pennsylvania Liquor Control Board (PLCB), while maintaining the PLCB’s licensing and regulatory functions. There is only one liquor store in Adams County. The governor’s plan would double the number of retail liquor outlets in Pennsylvania, and the proposed revenue from the sale of liquor and wine licenses would be used to fund a planned $1 billion, multi-year education block grant program. Moul said consumer surveys have consistently favored a private system. For details on the Corbett liquor privatization plan, go to www.RepMoul.com.